Qin's wars of unification were a series of military campaigns launched in the late 3rd century BC by the Qin state against the other six major states — Han, Zhao, Yan, Wei, Chu and Qi. During 247–221 BC, Qin emerged as one of the dominant powers of the Seven Warring States. The Chinese emperor was considered the Son of Heaven and the autocrat of All under Heaven. 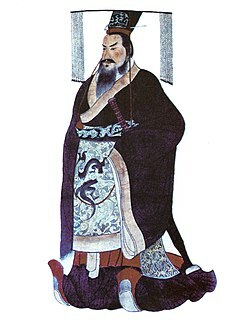 Under the Han dynasty, Confucianism replaced Legalism as the official political theory and succession theoretically followed Salic primogeniture. The Chinese emperors who shared the same family were classified into historical periods known as dynasties. The absolute authority of the emperor was notionally bound with various duties and obligations; failure to uphold these was thought to remove the dynasty's Mandate of Heaven and to justify its replacement. In practice, emperors and heirs sometimes avoided the strict rules of succession and dynasties' ostensible "failures" were detailed in official histories written by their successful replacements. The power of the emperor was also often limited by the imperial bureaucracy staffed by scholar-officials and eunuchs and by filial obligations to surviving parents and to dynastic traditions, such as those detailed in the Ming dynasty's Ancestral Instructions . Son of Heaven, or Tian Zi, was the sacred imperial title of the Chinese emperor. It originated with the ancient Zhou dynasty and was founded on the political and spiritual doctrine of the Mandate of Heaven. The secular imperial title of the Son of Heaven was "Emperor of China". The Heirloom Seal of the Realm, also known in English as the Imperial Seal of China, is a Chinese jade seal carved out of Mr. He's jade, a historically famous piece of jade. 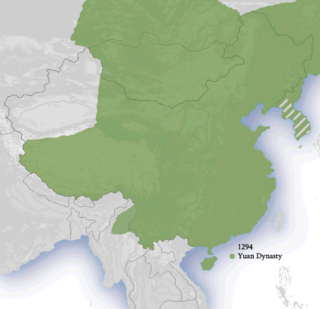 The Yuan dynasty, officially the Great Yuan, was the empire or ruling dynasty of China established by Kublai Khan, leader of the Mongolian Borjigin clan. It followed the Song dynasty and preceded the Ming dynasty. Although the Mongols had ruled territories including modern-day North China for decades, it was not until 1271 that Kublai Khan officially proclaimed the dynasty in the traditional Chinese style, and the conquest was not complete until 1279. His realm was, by this point, isolated from the other khanates and controlled most of modern-day China and its surrounding areas, including modern Mongolia. It was the first foreign dynasty to rule all of China and lasted until 1368, after which the rebuked Genghisid rulers retreated to their Mongolian homeland and continued to rule the Northern Yuan dynasty. 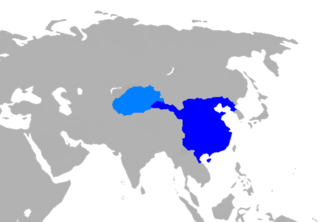 Some of the Mongolian Emperors of the Yuan mastered the Chinese language, while others only used their native language and the 'Phags-pa script. The Emperor's words were considered sacred edicts ( t 聖旨/ s 圣旨) and his written proclamations "directives from above" (上諭/上谕). In theory, the Emperor's orders were to be obeyed immediately. He was elevated above all commoners, nobility and members of the Imperial family. Addresses to the Emperor were always to be formal and self-deprecatory, even by the closest of family members. As the emperor had, by law, an absolute position not to be challenged by anyone else, his or her subjects were to show the utmost respect in his or her presence, whether in direct conversation or otherwise. When approaching the Imperial throne, one was expected to kowtow before the Emperor. In a conversation with the emperor, it was considered a crime to compare oneself to the emperor in any way. It was taboo to refer to the emperor by his or her given name, even for the emperor's own mother, who instead was to use Huángdì (皇帝), or simply Ér (兒/儿, "son", for male emperor). The emperor was never to be addressed as "you". Anyone who spoke to the emperor was to address him or her as Bìxià (陛下, lit. the "Bottom of the Steps"), corresponding to "Your Imperial Majesty"; Huáng Shàng (皇上, lit. Radiant Highness); Shèng Shàng (聖上/圣上, lit.Holy Highness); or Tiānzǐ (天子, lit. "Son of Heaven"). The emperor could also be alluded to indirectly through reference to the imperial dragon symbology. Servants often addressed the emperor as Wàn Suì Yé (萬歲爺/万岁爷, lit. Lord of Ten Thousand Years ). The emperor referred to himself or herself as Zhèn (朕), the original Chinese first-person singular arrogated by the First Emperor, functioning as an equivalent to the "Royal We", or Guǎrén (寡人, the "Morally-Deficient One") in front of his or her subjects. Shangdi, also written simply, "Emperor", is the Chinese term for "Supreme Deity" or "Highest Deity" in the theology of the classical texts, especially deriving from Shang theology and finding an equivalent in the later Tian of Zhou theology. Huang is a Chinese surname that means "Yellow". While Huáng is the pinyin romanization of the word, it may also be romanized as Hwang, Huong, Houang, Hoang, Wong, Waan, Wan, Waon, Hwong, Vong, Hung, Hong, Bong, Eng, Ng, Uy, Wee, Oi, Oei, Oey, Ooi, Oof, Ong, or Ung due to pronunciations of the word in different dialects and languages. Emperor Zhang of Han was an emperor of the Chinese Han dynasty from 75 to 88. He was the third emperor of the Eastern Han. 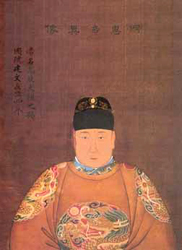 The Jianwen Emperor was the second emperor of the Ming dynasty in China. His personal name was Zhu Yunwen (朱允炆). The era name of his reign, Jianwen, means "establishing civility" and represented a sharp change in tone from Hongwu, the era name of the reign of his grandfather and predecessor, the Hongwu Emperor. His reign did not last long: an attempt to restrain his uncles led to the Jingnan rebellion. The Jianwen Emperor was eventually overthrown by one of his uncles, Zhu Di, who was then enthroned as the Yongle Emperor. Although the Yongle Emperor presented a charred body as Zhu Yunwen's, rumours circulated for decades that the Jianwen Emperor had disguised himself as a Buddhist monk and escaped from the palace when it was set on fire by Zhu Di's forces. Some people speculated that one of the reasons behind why the Yongle Emperor sponsored the admiral Zheng He on his treasure voyages in the early 15th century, was for Zheng He to search for the Jianwen Emperor, who was believed to have survived and fled to Southeast Asia. Some historians believe that the Jianwen Emperor had indeed survived and escaped from Nanjing, but the official histories of the Ming dynasty were modified later during the Qing dynasty to please the Manchu rulers. Emperor Xianwen of Northern Wei ( 魏獻文帝) (454–476), personal name Tuoba Hong, was an emperor of the Xianbei dynasty Northern Wei. He was the first emperor in Chinese history who, after retiring in favor of his son Emperor Xiaowen to become Taishang Huang in 471, continued to hold on to power until his death in 476—when the official history states vaguely that he may have been killed by his stepmother Empress Dowager Feng. Zhu Manyue, later known by her Buddhist name Fajing (法淨), was a concubine of Emperor Xuan of Northern Zhou, an emperor of the Chinese/Xianbei dynasty Northern Zhou, and she was the mother of Emperor Jing. This is a family tree of Chinese emperors from the foundation of the Qin dynasty in 221 BC, till the end of the Sixteen Kingdoms period, in the first half of the fifth century AD. In Chinese history, a Taishang Huang or Taishang Huangdi is a retired emperor who had, at least in name, abdicated in favor of someone else. Although technically no longer the reigning sovereign, there are instances where the retired emperor continued to exert considerable power, if not more than the reigning emperor. 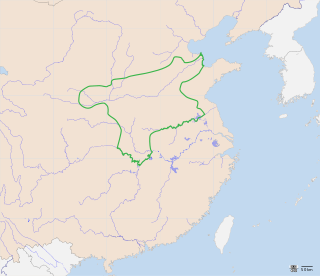 The unnamed daughter of Emperor Xiaoming of Northern Wei was briefly the emperor of Northern Wei (386–534), a Xianbei dynasty that ruled Northern China from the late fourth to the early sixth century AD. She bore the surname Yuan, originally Tuoba. Yuan was the only child of Emperor Xiaoming, born to his concubine Consort Pan. Soon after her birth, her grandmother the Empress Dowager Hu, who was also Xiaoming's regent, falsely declared that she was a boy and ordered a general pardon. Emperor Xiaoming died soon afterwards. On 1 April 528, Empress Dowager Hu installed the infant on the throne for a matter of hours before replacing her with Yuan Zhao the next day. Xiaoming's daughter was not recognised as an emperor (huangdi) by later generations. No further information about her is available. Chinese theology, which comes in different interpretations according to the classic texts and the common religion, and specifically Confucian, Taoist and other philosophical formulations, is fundamentally monistic, that is to say it sees the world and the gods of its phenomena as an organic whole, or cosmos, which continuously emerges from a simple principle. This is expressed by the concept that "all things have one and the same principle". This principle is commonly referred to as Tiān 天, a concept generally translated as "Heaven", referring to the northern culmen and starry vault of the skies and its natural laws which regulate earthly phenomena and generate beings as their progenitors. Ancestors are therefore regarded as the equivalent of Heaven within human society, and therefore as the means connecting back to Heaven which is the "utmost ancestral father". Chinese theology may be also called Tiānxué 天學, a term already in use in the 17th and 18th century. The Wǔfāng Shàngdì, or simply Wǔdì or Wǔshén are, in Chinese canonical texts and common Chinese religion, the fivefold manifestation of the supreme God of Heaven. This theology harkens back at least to the Shang dynasty. Described as the "five changeable faces of Heaven", they represent Heaven's cosmic activity which shapes worlds as tán 壇, "altars", imitating its order which is visible in the starry vault, the north celestial pole and its spinning constellations. The Five Deities themselves represent these constellations. In accordance with the Three Powers they have a celestial, a terrestrial and a chthonic form. The Han Chinese identify themselves as the descendants of the Red and Yellow Deities. ↑ Baxter, William & al. Baxter–Sagart Old Chinese Reconstruction Archived September 27, 2013, at the Wayback Machine . 2011. Accessed 22 Dec 2013. Wikimedia Commons has media related to Emperors of China .